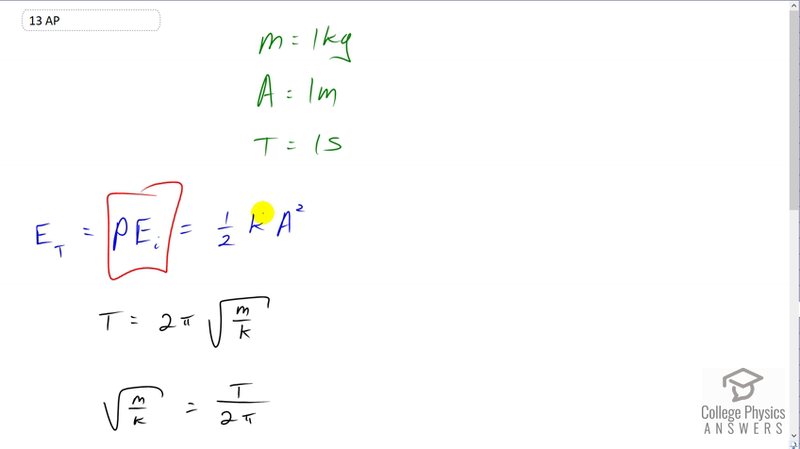 A mass of 1 kg undergoes simple harmonic motion with amplitude of 1 m. If the period of the oscillation is 1 s, calculate the internal energy of the system. This is College Physics Answers with Shaun Dychko. We're going to calculate the total energy of this simple harmonic oscillator. And that's going to equal the initial potential energy that it has which we have a formula for, which is one half times the spring constant times amplitude squared. Now, we're not giving this spring constant k but we can figure out based on the information that we're are given. We're given the mass, the amplitude and the period. So period is two Pi times square root of mass over k. And we're going to solve this for k. And we'll divide both sides by two Pi and we get square root m over k equals T over two Pi. And then raise both sides to the exponent negative two. The negative sign serves to flip both the fractions and then we square it after flipping. And so we end up with k over m on the left and then four Pi squared over T squared on the right. And then multiply both sides by m and now we have k in terms of m and T which we both know. And so that's four Pi squared m over T squared. So we substitute that into our formula for total energy. And we do that here. So that's total energy is one half times four Pi squared m over T squared times amplitude squared and this works out to two Pi squared mA squared over T squared. So that's two Pi squared times one kilogram times one meter squared divided by one second squared giving us two Pi squared which is 19.7 Joules.